These last two weeks have been busy, and I've been wanting to bake. I've wanted to bake a delicious treat, a tasty treat, but also a summertime treat. 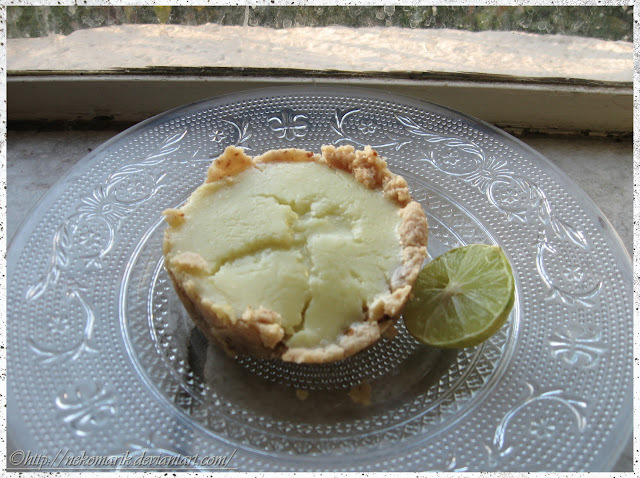 Since I just got a new recipe book, and there's a recipe for a white chocolate lime pie in there, I decided on key lime pie! 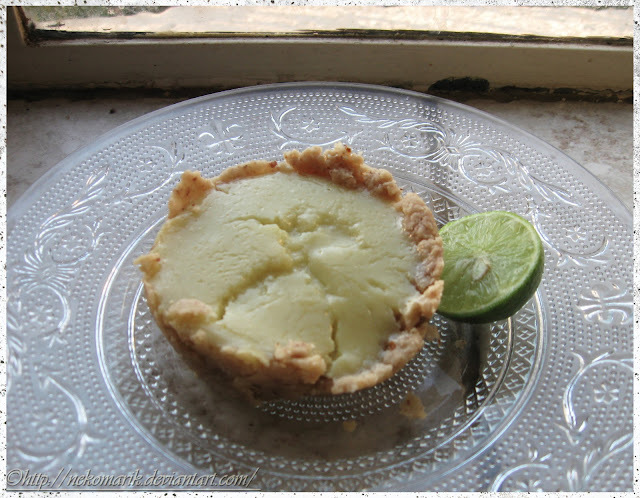 My key lime pie features fresh lime juice and a crust using crushed almonds as half of the flour. Can you say "yummy"? Here you can see 3 muffin cups with prepared crust, and one with about the amount of dough needed to make a nice crust. A more aesthetic shot of the same view, just for kicks. Doesn't that almondine crust look scrumptious? I layed out the leftover crust in a small, 7-inch tart pan and then proceeded to make the filling as the crust pre-baked, 15 minutes for that lovely texture. Let the crust cool a bit after coming out of the oven, of course, before pouring in the filling! I based my filling loosely off Emeril Lagasse's recipe, though I found it too sour for my liking and added about 2/3 cup sugar to the batter. Pre-oven sentencing. Tasty pasty, isn't it? I did cheat a little and added 3 drops of green food colouring to the batter, for aesthetic's sake. But don't worry, it was organic food colour! And by "organic" I mean the molecule contains carbon. Here you can see the tarts after baking in the oven 17 minutes, until the fillings were settled entirely (I jiggled the pan before taking it out.) Took one of them out and placed it on a plate to take a photo. The crust texture was all wrong- crumbly and soft, like mazapan, and fell apart when I removed the tart from the muffin pan. I tasted the crust, which did not at all have the toasty almond flavour I expected- in fact it tasted almost...raw. It took me a second to figure out that I'd likely forgotten to actually set the oven to bake when I set the initial temperature for the crust, since it's a two-dial oven! Oh no! What to do? That there is my easy-peasy solution. Yay! Luckily, my hard cerebrum came to the rescue! 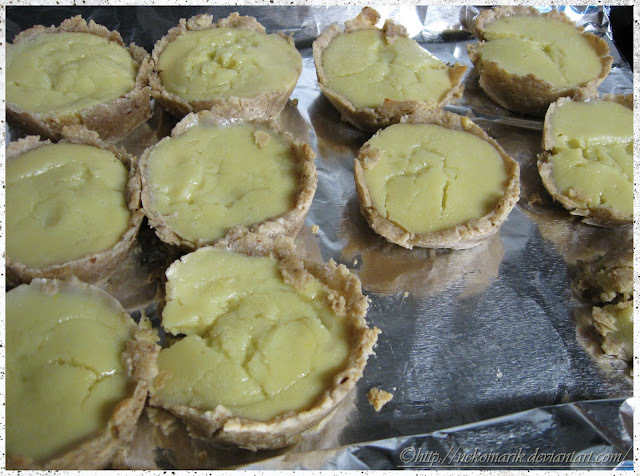 I decided to take all the tarts out very, very carefully so they wouldn't suffer the same fate as the on in the photo. It broke further when I transferred it to the foil paper on the cookie sheet, and you can tell it's the one to the left of the gap. I baked them 15 more minutes before taking them out again, and it worked! I was able to transfer them to a container easily with minimal "dusting" of the crust, and placed them in the refrigerator to cool before being eaten. Now, the part you likely scrolled through for- the recipe! Minus the mishaps you may have noticed if you skimmed this post, of course. 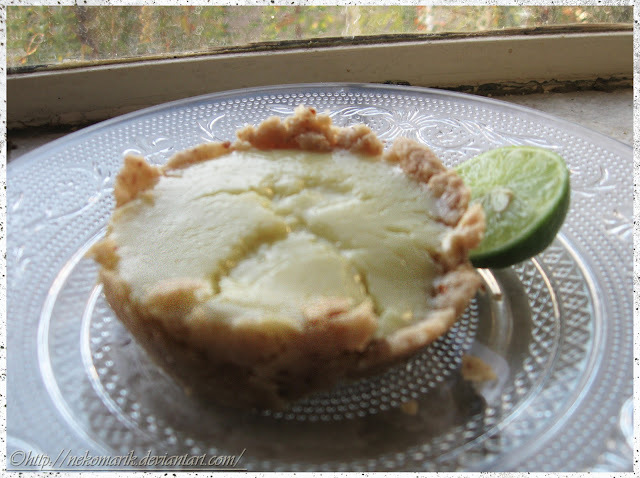 Makes approximately 18 mini tarts or 1 deep dish 9-inch pie. Preheat oven to 350˚ F. In blender or food processor, pulverize almonds to a fine powder and pour into small mixing bowl. There will be some lumps, but if blended well they should be clumped patches of powder, and will fall apart easily when touched. Add flour and melted butter, and quickly knead to a paste-like consistency that is moldable but not sticky. It should be just a bit crumbly, but enough to hold together. 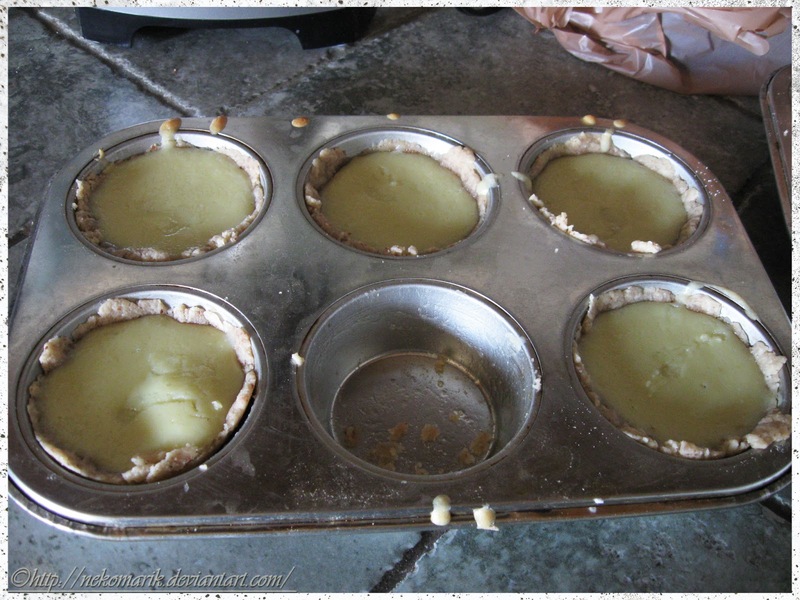 Press into the bottoms and up the sides of muffin pans or 9-inch pie. Bake 15 minutes and allow to cool completely before pouring in filling. 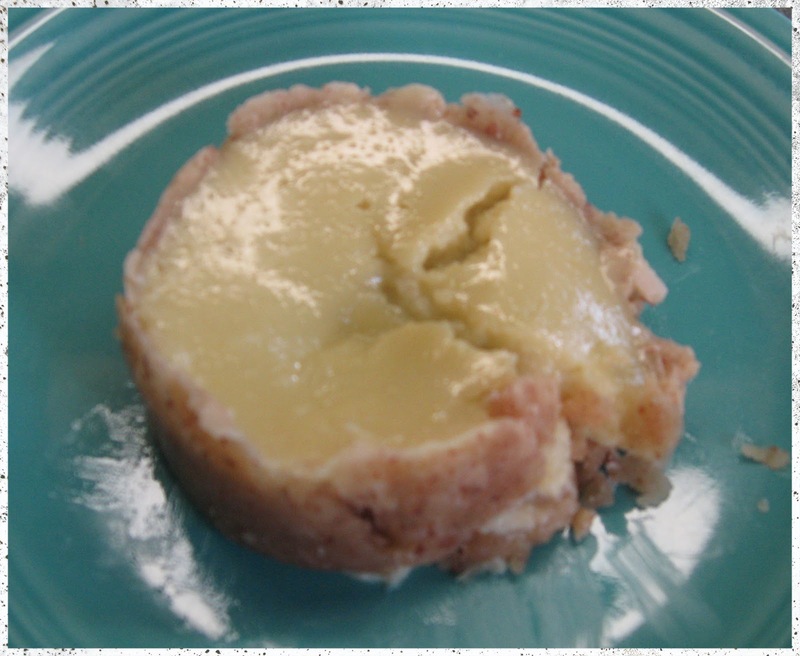 Lower oven temperature to 325˚ F. Whisk lime juice, sweetened condensed milk, and both eggs together in large bowl. The milk will refuse to mix with the juice at first, so a wire whisk is recommended. Slowly whisk in sugar, followed by beating in lime zest. Pour into prepared pans and bake for 17-20 minutes, until filling is settled and does not move. Let cool before refrigerating 30 minutes prior to serving. Questions? Feedback? Critiques? Advice? Just drop a comment here and lemme know! So, here's process of a single-file walkthrough I uploaded to my deviantART a bit ago, for this drawing. You can see where my inking went wrong with the smudging, but I wasn't about to start over or give up. So I ploughed on to base colouring with coffee and paint+coffee. As you can see, there's a couple things that went somewhat awry, but it was decent enough overall for me to go on with my coloured pencils, Sharpie oil paint pen, and more watercolours and coffee. 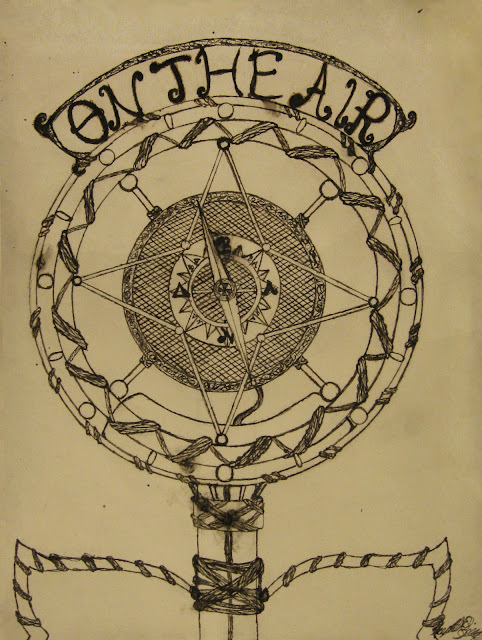 I went for a burnished, antique look- I originally wanted a Hellenistic-style compass, which is why there's a theta in place of an o. Yes, I could have used an omega, but it didn't really say "ancient Greek navigation" to me. The lack of accuracy does bother me, of course, but the drawing is done and I'm still happy with it!